Just Mix, Drink & Enjoy! Shake things up with Pro Clinical Hydroxycut Instant Drink Mix packets – a delicious way to help you manage your weight! This great tasting weight management drink mix contains the same scientifically researched key weight management ingredients and the same key energy-boosting ingredient as Pro Clinical Hydroxycut caplets, but in convenient, on-the-go single-serve packets! Managing Your Weight Never Tasted So Great! Delicious and convenient, this formula contains a key ingredient that is scientifically researched in a study to support real results! With Pro Clinical Hydroxycut Instant Drink Mix packets in your diet and exercise plan, managing your weight never tasted so great! Open a standard 500mL bottle of water, take a sip, then empty one packet into the bottle, shake and consume it immediately 2 times daily. Take each serving approximately 30 to 60 minutes before meals. Do not exceed 2 servings (2 packets) in a 24-hour period. For best results, use for 60 days in conjunction with a calorie-reduced diet and a regular exercise program. 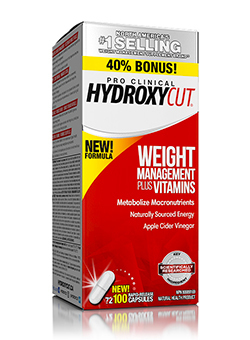 Find Hydroxycut Pro Clinical Sachet Drink Mix at Shoppers Drug Mart. Find Hydroxycut Instant Drink Mix at HealthSnap. Find Hydroxycut Instant Drink Mix at London Drugs.